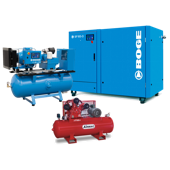 The Boge C-Series screw compressors are designed for long-term performance. A refrigerant dryer mounted on a horizontal receiver is available as an option. Even at full load operation the compressor operates reliably and safely at optimum efficiency providing a long service life. 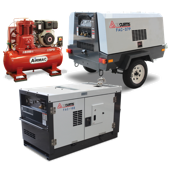 In conjunction with the frequency controlled drive the directly coupled screw compressors of this series provide an extremely flexible system which spontaneously adapts to any changes in the customers compressed air or pressure demands. In the event of a change of the pressure value, the output quantity is synchronised automatically. A 13 bar machine is thus transformed into an 8 bar machine yielding a correspondingly higher output - without any expensive remodelling or design related modifications. The frequency converter flexibility controls the motor speed and therefore the airend. This ensures the compressor output automatically adjusts to the momentary demand. The airend operates at the necessary speed to generate as much compressed air as is required. Expensive idling as well as load/no load cycles are thus eliminated. At the same time, a tighter pressure band can be maintained, also helping to save energy. 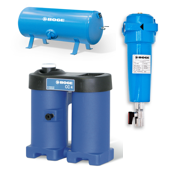 The compressor is controlled via the BOGE BASIC control with LC display and pressure sensor technology. The BOGE FOCUS control is available as an optional extra, offering further monitoring and control possibilities. The directly coupled, frequency controlled C-series is equipped with a refrigerant dryer. This enables users to generate dry air without any additional space requirements.